Generally, if you want to meet a highly revered Tibetan Buddhist master, you book a ticket to the Himalayan regions of Northern India, Nepal, or Tibet. However, September 5 and 6, His Eminence the 7th Ling Rinpoche, the reincarnation of His Holiness the 14th Dalai Lama’s Senior Tutor, will visit and teach at Sravasti Abbey and gives a noon public talk at North Idaho College in Coeur d’Alene. His visit offers a rare opportunity to meet an extraordinary Tibetan teacher. His Eminence Ling Rinpoche’s predecessor, His Eminence the 6th Kyabje Yongzin Ling Rinpoche, ordained Abbey founder and abbess Venerable Thubten Chodron as a novice nun in 1977. Rinpoche gave her his lineage name, “Thubten,” at that time, which she has passed on to most of the monastics living at Sravasti Abbey. Therefore, it is with special joy that we welcome his successor, the 7th Ling Rinpoche, for his first visit here. His Eminence the 6th Ling Rinpoche’s thousands of students include masters from all four Tibetan Buddhist schools. He was a renowned teacher in Tibet. He continued to share the Dharma after he went into exile, teaching in the newly established Tibetan monasteries in India, as well as giving public and private teachings in India Europe, and North America. H.E. the 6th Ling Rinpoche passed away in 1983 amid extraordinary signs. (Read his biography.) At that time, His Holiness the Dalai Lama composed a prayer for the swift return of his teacher’s unmistaken reincarnation. His Eminence the 7th Ling Rinpoche was born in India in 1985 and recognized as the reincarnation of H.H. the Dalai Lama’s Senior Tutor at 18 months old. He was enthroned in 1987 and received his novice monastic ordination from His Holiness the Dalai Lama in 1993. He also received full monk or bhikshu precepts from His Holiness exactly 50 years after the Dalai Lama had received them from his Senior Tutor, Rinpoche’s predecessor. 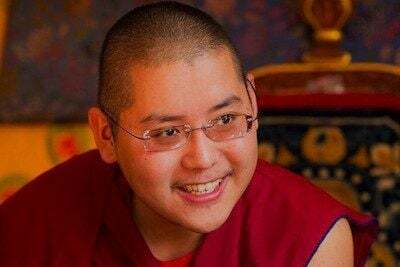 The 7th Ling Rinpoche entered Drepung Monastic University’s Loseling College at the age of five, commenced monastic studies at age 10, and culminated his monastic education with his geshe degree—the rough equivalent of a PhD— in 2016. He has been well trained to follow in the footsteps of his predecessor. Read his full biography and details of his discovery here. Abbey founder Ven. Thubten Chodron has met H.E. 7th Ling Rinpoche several times. “Whenever I’ve spoken with him,” she said, “I can see his mind is very quick. He understands fine points in a discussion and is able see complex topics from various angles. Rinpoche speaks in a straightforward manner and is astute regarding Western culture.” She is eager for him to meet Abbey residents as well as the students at North Idaho College. Rinpoche has taught throughout Asia, Europe, North America, and Israel. He has also been involved in many important Buddhist events, including requesting His Holiness the 14th Dalai Lama’s historic series of Jangchup Lamrim teachings in South India and participating in Mind and Life Institute dialogues between His Holiness and scientists. Please join us for this rare opportunity to meet His Eminence the 7th Ling Rinpoche! For the Abbey teaching, please let us know you’re coming so we can hold your place.